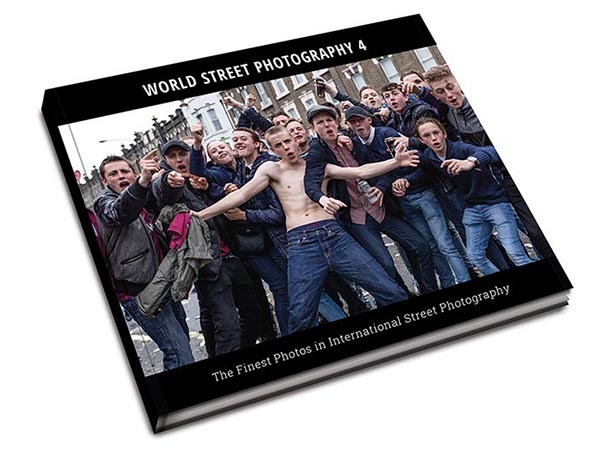 Another year has passed, ten thousands of photos were uploaded for the street competitions and we now can proudly present to you the 4th edition of the World Street Photography photo book! Congrats to all who have joined this great project! It was again a long and hard but also very grateful job reviewing the 20179 photos, 2320 photographers uploaded from 77 countries. The result is the thickest photo book we ever made, containing the crème de la crème of street photography. In the book are 222 inspiring street photos from 160 photographers from 33 countries. Within the 4th World Street Photography book there is also a selection of the projects “The porch” and “Public Transportation”, both great projects which had been going for years and now found a place in the book. The photo featured on the cover of the book is a photo from Ed Robertson titled "The hammers". This year we also have a back cover photo which is Michał Orliński's photo "Soldiers". The intro of the book was written by Michael Ernest Sweet, and is a great read! Now that WSP 4 has gone to press, we can reveal who is in the book. to preview, (click here). Click on the image and see it full size. Like last year we will again donate the profits we make with the book to the Ashalayam organization. Don Bosco Ashalayam, Kolkata is an Indian NGO working for the rehabilitation of street and destitute children. Ashalayam provides assistance to all children in need, regardless of religion, caste, or gender. Over 500 children reside in Ashalayam’s twenty shelter homes and benefit from educational, vocational, and recreational opportunities. Through its street presence and various programmes in the slums and railway stations, Ashalayam also provides assistance to thousands of street children every year. Over three decades, Ashalayam has helped over 80,000 children.